Another week, another round of new products. This week is also special, since it's the official release of the RedBoard. Hello loyal followers, occasional visitors, and accidentally stumbled upon us-ers! We're back, because it's Friday. So that means it's time for some new products. Not only do we have some new products this week, but we've also got another demo, in addition to the product video. Once we started shooting the normal product video, it became pretty obvious that the fingerprint reader warrants its own demonstration video. So, here's a video just for the fingerprint reader. Hopefully that helps. It's a simple sensor, but it helps to just see it in action. It's no secret that we have a lot of Arduino-related products. It makes up a good part of our product catalog. We even manufacture the Arduino Pro, Pro Mini, Pro Micro, and the LilyPad lineup (not to mention the ProtoSnap line as well). Every Arduino board is a bit different and has unique advantages and disadvantages. We decided to make a board that we wanted to use that combined many of our favorite features. The RedBoard incorporates the trusty FTDI from the old Duemilanove, the Optiboot from our own Pro series, and the shield compatability from the R3 Uno. This week we have some new mini breadboards. 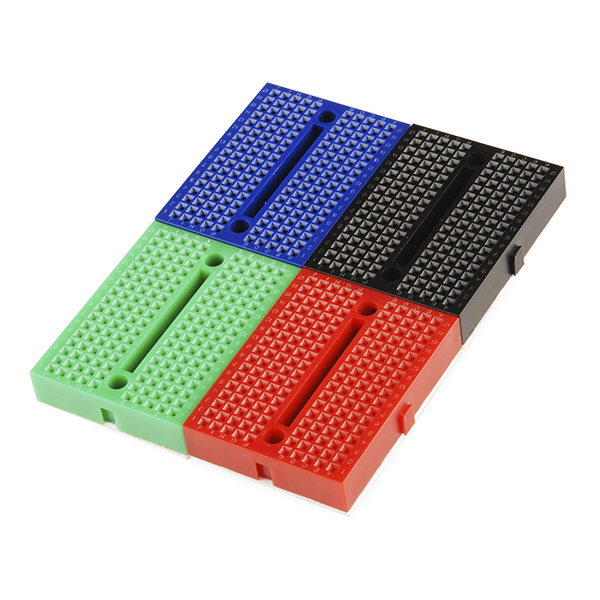 These new mini modular breadboards are cool because they can actually snap together to form larger prototyping areas. They even have two mounting holes in addition to the adhesive on the back. Stick them down, screw them down, and connect a bunch together. They're really handy to have around for all your projects. Also, we have our older mini breadboards on sale, so get them while they last! We also have a nice new fingerprint scanner from ADH Tech. It uses an optical sensor to take a picture of the fingerprint and then store the information onboard. You can store and compare up to 20 fingerprints. Everything operates over a serial interface with basic commands. 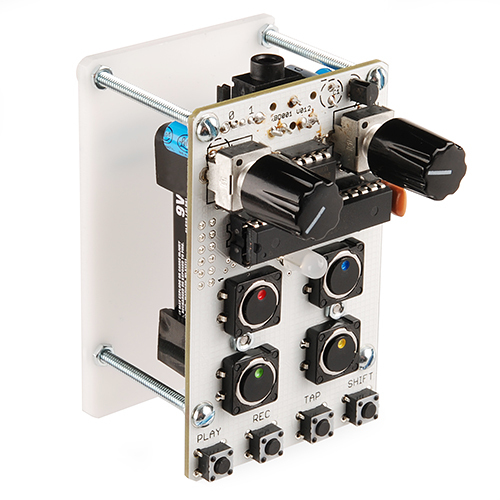 The Bleep Drum is an Arduino based, lo-fi rad-fi drum machine designed by Dr. Bleep of Bleep Labs. This easy through-hole soldering kit turns into a super addictive noise-maker that's sure to keep you entertained for irresponsible lengths of time. Use it as a drum machine or a noise generator. It hooks directly up to speakers, headphones, or an audio recorder. We now have a breakout board for the VS1063 MP3 IC. This is the same chip that's at the heart of the MP3 trigger. 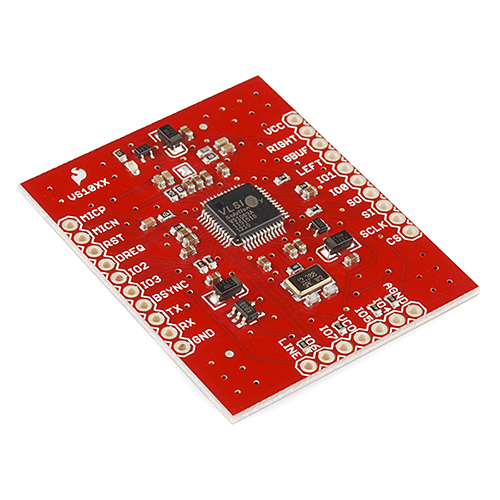 Now we have it on a simple breakout board, similar to the VS1053. The two chips are similar, but the VS-1053 has MIDI capabilities, where the VS1063 does not. Just a bit of fair warning for everyone, the rest of the products are retail. So, if you're not interested in what we've got going into retail stores, there's no need to read any further (unless you love reading these product posts in my voice and haven't had enough yet). The first retail product for this week is Mr. Roboto. 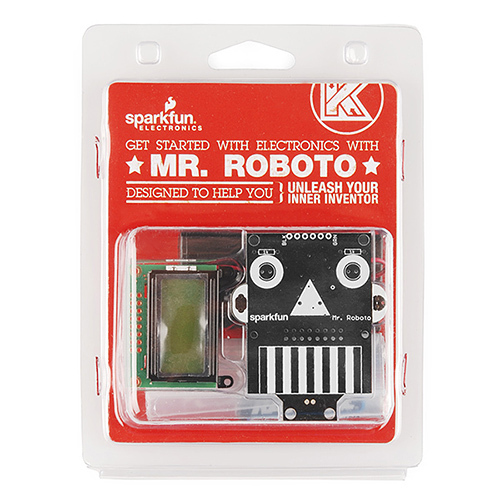 Mr. Roboto is a nice entry-level kit that is good for playing around with code. It has an LCD, light sensor, temp sensor, and even a buzzer. Put it together and start leaning how to interact with the various hardware. Next up is the Button Kit. 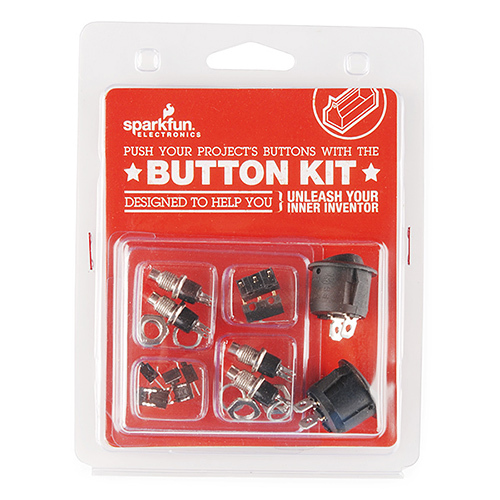 This kit includes some of our most popular buttons and switches. It includes such classics like rocker buttons, snap-action switches, momentary buttons, and more! It comes with a total of 14 buttons/switches. 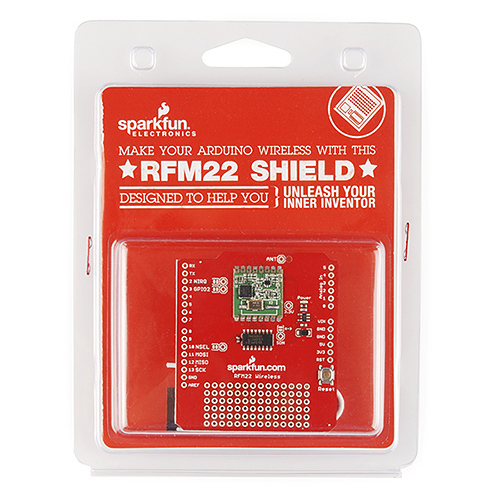 The RFM22 Shield also makes now comes wrapped in retail packaging. As with all shields, it comes with stackable headers. We even made a nice quickstart guide to get you started. 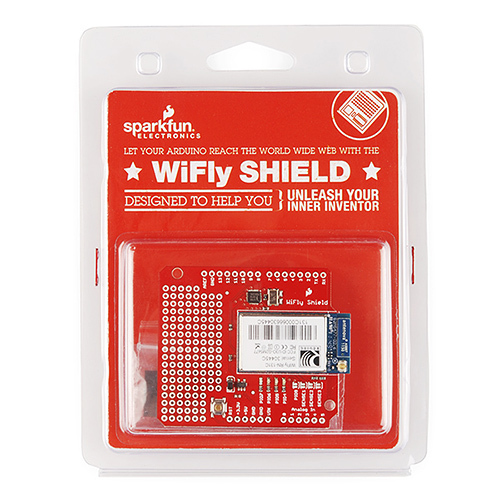 Speaking of wireless shields, the WiFly Shield also gets it's retail debut this week. Like the RFM22 shield, it also comes with headers. We're still working on a quickstart guide for this, but expect one very soon. 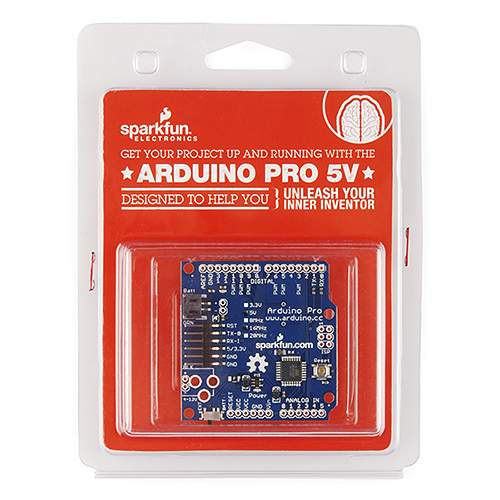 And lastly the classic Arduino Pro 5V gets a spot in the retail lineup. 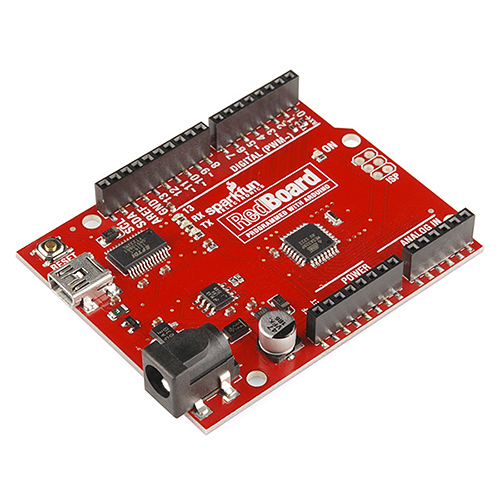 If you need a small board that still accepts shields, the Pro is worth a look. That's it for this week. Hopefully the new product-specific videos are helpful for some of you. We'll be back next week with more new products and quite possibly some more demos. Thanks for reading and see you then! Straight from the horses mouth, Robert! Can we get power rails that snap onto those mini breadboards? we've been looking :-) we had the same idea. good idea!!! Also, does anyone know if they snap somehow to larger breadboards? Is it just me or does the horse look like a giant pez dispenser? This idea is made of awesome. A giant pez dispenser that dispenses electronics! +1 A whole stack of ardinopros in sparkfun little red boxes. In keeping with the spirit of past Spark Fun demo projects (and their high danger level) they should probably shoot out at high speed, and since PEZ derives from peppermint you should include those red and white peppermint candies. The little red box idea is the icing on the cake here. I could just imagine this in use at their booth to hand out swag. Strange, I replied to #100529's comment and it set it on Nick's reply. Oh well, still valid and would love to see this in reality. OK, sorry about the rant last week. OK, you got me...the button kit is actually pretty cool. Damn had a similar design in the works in eagle (like your red board) except its a smaller footprint. Is it possible to link the finger print readers to a server and then enroll more than 20 users at a time that way? In theory it would take longer but you could do it. If it was a verification system, not an identification system, it wouldn't be too bad. Just load the requested template to the module, verify, clear the module. I would imagine this would be possible since you are able to add templates, you would be able to update them and check whether or not they verify. It's algorithm BTW, not 'alogarithm'. Nice catch, I went ahead and added it! Hi Nick and Robert, fun to watch -- as always. For security application the swipe-type reader has its advantage since you cannot directly -- or at easily lift and duplicate the finger print. Would you know whether a photo-copied version of your index finger works as well? Another video of how to hack finger print readers in general would be cool - or would you get into troubles with that? 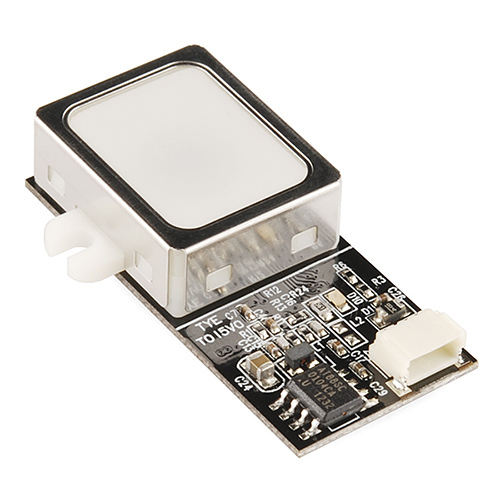 In any case, very nice sensor description and looks useful to be used in other non-security applications. At least it's not in his bed ! Friday Product Post: Hip Hip Array! New Product Friday: Don't Tweeze Me Bro!